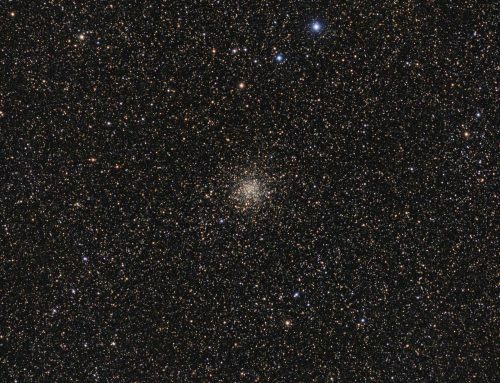 M5 is a globular cluster made up of hundreds of thousands of stars. It’s one of the finest examples of these kinds of objects, and one of my personal favourites to view at the eyepiece of any scope. They remind me of sugar spilled on a black table cloth. 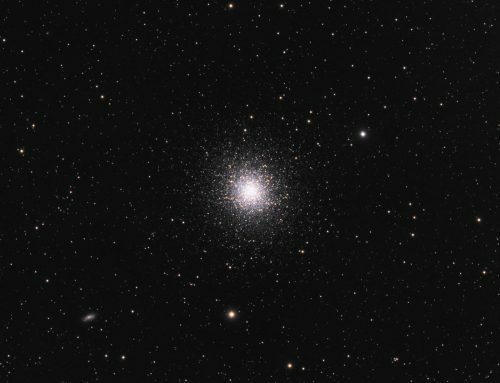 Although some globular clusters, like this one, are large and relatively bright, they can be challenging to image because they are very bright at the centre, but contain faint stars at their fringes. If one uses long exposures, the core gets “burnt out”. But short exposures don’t give you the faint stars. The solution: High Dynamic Range (HDR) techniques. For this shot, I shot 10m, 3m and 30s subs for luminance and combined them. The detail in the core comes from the short frames and the faint outer halo of stars came from the longer frames. It took me 12 weeks between May and August 2013 to acquire this shot, due to many factors. For one thing, the weather was terrible for astroimaging. 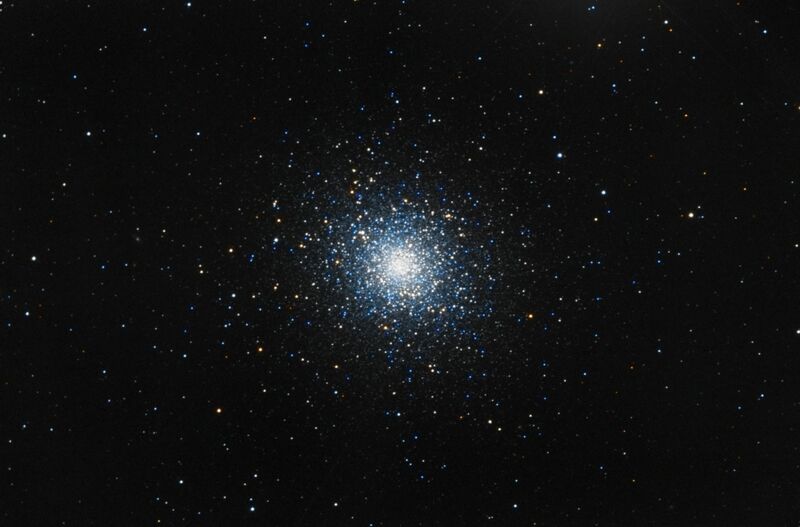 A previous version was Astronomy Magazine’s online Picture of the day on August 16, 2013. 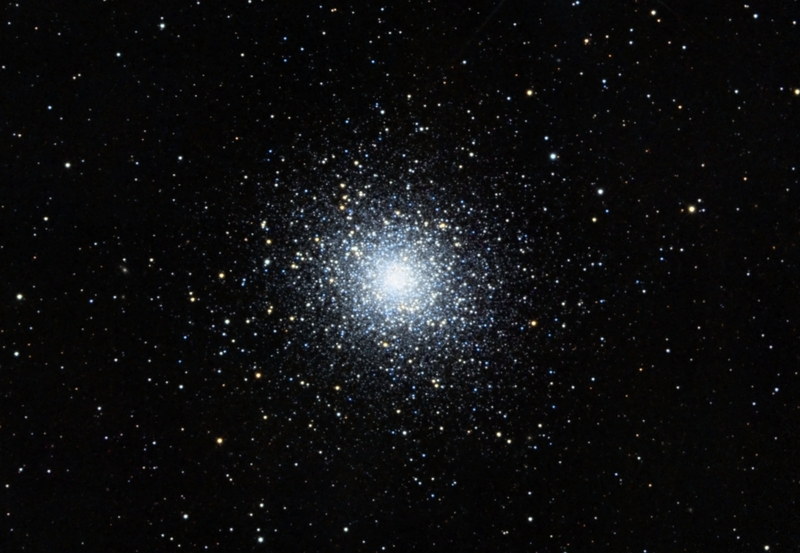 SBIG STL-11000M camera, Baader LRGB filters, 10″ f/6.8 ASA astrograph, MI-250 mount. Guided with STL-11000’s internal guider. Focused with FocusMax. Acquisition, guiding and calibration in MaximDL. Registration, integration and all processing in PixInsight. Shot from my SkyShed in Guelph, Ontario. No moon for L; moderate moonlight for RGB. Average transparency and average seeing for RGB acquisition; good for L acquisition. Creation and cleanup: The R, G and B masters were combined with ChannelCombination, and the resulting RGB image was cropped and processed with DBE, followed by BackgroundNeutralization and ColorCalibration. Linear Noise Reduction: MultiscaleLinearTransform was used to reduce noise in the background areas of the RGB image. Layer settings for threshold and strength: Layer 1: 3.0, 0.5 Layer 2: 2.0, 0.39 Layer 3: 1.0, 0.25 Layer 4: 0.5, 0.1. A mask was used to protect high signal areas. Stretching: HistogramTransformation was applied to make a pleasing yet bright RGB image. Creation and cleanup: The three L masters were each processed with DBE and then combined using the HDRCombination tool. The resulting image was cropped to match the RGB. Deconvolution: A copy of the Luminance was stretched to use as a deconvolution mask. A star mask was made from unstretched Luminance to use as a local deringing support. Deconvolution was applied (80 iterations, regularized Richardson-Lucy, external PSF made using DynamicPSF tool with about 25 stars; local deringing at 70% and global dark deringing at 0.03). Stretching: HistogramTransformation was applied to make an image with similar brightness to the RGB image. TGVDenoise was applied and the image was re-stretched to reset the black point. 1. Extract luminance from the RGB image. 2. Apply LinearFit using Luminance as the reference. 3. Use ChannelCombination in Lab mode to replace the RGB’s luminance with the fitted luminance from step 2. 4. LRGBCombine was then used to make a LRGB image by applying Luminance to RGB. A copy of the LRGB image was processed with HDRMultiscaleTransformation (6 and 4 pixel scales. Contrast, brightness and saturation were adjusted in several iterations with the Curves tool, with separate adjustments were made for background and stars using a mask. The copy was blended back with the original (original:copy = 70:30).